Home - Nash's Towing INC. Welcome to Nash’s Towing Inc., service that always has your interests in mind. We want to help facilitate the assistance we can offer our customers. Feel free to tour our website and find out just how much we provide to our customers: any need you might have regarding towing services are clearly elucidated in our website. We’ve all been there, in the middle of nowhere, on a long, empty stretch of road. Suddenly, the car overheated! Maybe it happened to you on a busy highway, unthinkably, a tire went flat. Or maybe your car just wouldn't start one afternoon. Your vehicle is one of your largest financial investments and having it towed for any reason can be a nerve-racking experience, Nash’s Towing Inc. understands all the unpleasantness of being stranded on the side of the road and are here for you. 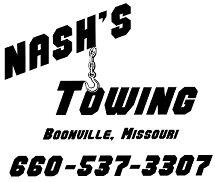 Nash's Towing was established in 1995, servicing the Boonville Missouri and surrounding areas. We have maintained our continuous dedication to upholding honest business principles and perfecting our professional towing and recovery services. With our quick response times and competitive prices, our experienced, licensed drivers take the utmost care of your vehicle while it is being towed. 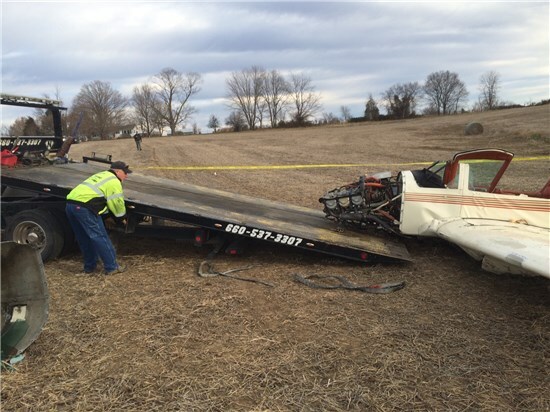 From off-road recovery and flatbed service to jump-start and lockout services, we do it all! Call Nash's Towing Inc. for all your towing service needs! When you need towing or roadside recovery services, our motivated team is available for fast and efficient help. Trust our professional operators for the best and utmost professional services. We Service all of Cooper County and Howard County areas including Boonville, Blackwater, Buncenton, Pilot Grove, Prairie Home, Otterville, Franklin, New Franklin, Boonsboro, Armstrong, Fayette, Glasgow, Rocheport and Nelson we also cover any and all surrounding areas. Feel comfortable asking our knowledgeable staff any questions. We immediately address your concerns with helpful advice, honest answers, and ideal recommendations. We take pride in working with honesty and integrity. Always expect affordable prices, reliable support and personalized attention. Receive friendly service paired with old fashion courtesy from start to finish. Your satisfaction is our main concern.